Before you begin to convert your automobile or truck engine to use alcohol, it's important that you understand the properties of - and the differences between - the two fuels. Gasoline is a complex mixture of hydrocarbons ... substances comprising just hydrogen and carbon atoms. These hydrocarbons can appear in all forms (as a gas, liquid, or solid), but for our purposes, we're concerned with the fuel in its liquid state. To derive various hydrocarbon fuels, the industry merely refines crude oil (made many millions of years ago as a result of geological and biological cycles) and draws off the desired product at a certain temperature and pressure. Hence there are the lighter, gaseous fuels such as butane, propane, and ethane ... the liquids like octane, pentane, and hexane ... the heavier, oily liquids such as kerosene and fuel oil ... and so on all the way down through waxes and finally solids. Alcohol, on the other hand, has to be manufactured ... in our case through fermentation and distillation processes. Because of the steps involved in its manufacture, alcohol has always been more expensive than gasoline to produce. But now, with dwindling crude oil supplies, the price of gasoline is skyrocketing ... and soon gasoline itself will probably have to be synthetically manufactured, at a cost far greater - since the production process is much more complicated than that of alcohol. Alcohol compounds are also hydrocarbons ... but in alcohol, one of the hydrogen atoms has been supplanted by a hydroxyl radical (hence the OH symbol), which is an oxygen atom bonded to a hydrogen atom. Alcohols, too, take many forms and have various levels of complexity, but we're concerned mainly with ethanol (grain-derived alcohol) and - just in passing - methanol (wood- or cellulose-derived alcohol). On the surface, the difference between alcohol and gasoline might appear relatively minor: Alcohol contains oxygen, while gasoline doesn't. In reality, however, the dissimilarities are far more complex than that. Additionally, under compression - as is the case in an engine's combustion chamber - things get even more complicated ... but we'll get more into detail on these points later. Be that as it may, alcohol has characteristics that make it a natural engine fuel:  It has a high octane" rating, which prevents engine detonation (knock) under load,  it burns clean ... so clean, in fact, that not only are noxious emissions drastically reduced, but the internal parts of the engine are purged of carbon and gum deposits ... which, of course, do not build up as long as alcohol is used as fuel,  an alcohol burning engine tends to run cooler than its gasoline-powered counterpart, thus extending engine life and reducing the chance of overheating. At this point, we can detail exactly how these and other characteristics of alcohol affect engine performance. 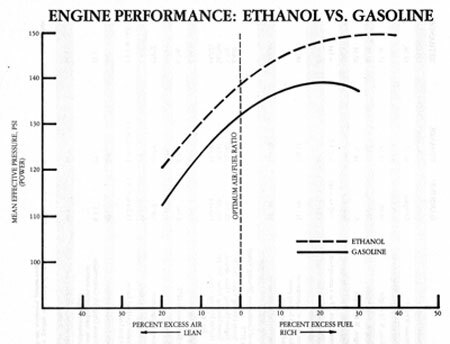 Because a high compression ratio in an engine results in more power per stroke, greater efficiency, and better economy, it's easy to see why a fuel that resists pre-ignition even under high compression conditions is especially desirable ... and alcohol is, on the average, about 16 points higher on the research octane scale than premium gasoline. The heating value of a fuel is a measure of how much energy we can get from it on a per-unit basis, be it pounds or gallons. When comparing alcohol to gasoline using this "measuring stick", it's obvious that ethanol contains only about 63% of the energy that gasoline does ... mainly because of the presence of oxygen in the alcohol's structure. But since alcohol undergoes different changes as it's vaporized and compressed in an engine, the outright heating value of the ethanol isn't as important when it's used as a motor fuel. The fact that there's oxygen in the alcohol's structure also means that this fuel will naturally be "leaner" in comparison to gasoline fuel without making any changes to the jets in the carburetor. This is one reason why we must enrich the air/fuel mixture (add more fuel) when burning alcohol by increasing the size of the jets, which we'll discuss further in another section. The volatility of a fuel refers to its ability to be vaporized. This is an important factor, because if vaporization doesn't occur readily, the fuel can't be evenly mixed with air and is of little value in an engine. Some substances that are highly volatile can't easily be used as a motor fuel ... and others, which have excellent heating value, aren't volatile enough to be used in an engine (such as tars and waxes). Another point to keep in mind is that a very volatile fuel is potentially dangerous, because of the chance of explosion from heat or sparks. This is one reason why alcohol, with a higher flash point than gasoline, is a much safer automotive fuel ... especially considering that the average car's storage tank is really quite vulnerable. Latent heat of vaporization is the phenomenon that results in an alcohol-powered engine's running cooler than its gasoline-fueled counterpart. When a substance is about to undergo a change in form (from a liquid to a vapor, in this case), it must absorb a certain amount of additional heat from its surroundings in order for the change to take place. Since alcohol must absorb roughly 2-1/2 times the amount of heat that gasoline does, and the heat naturally is taken from the engine block, the engine should operate at a much lower temperature ... in theory, that is. What happens in reality is that the alcohol/air mixture doesn't have time to absorb all the heat it could during its short trip through the engine manifold. So instead of running 2-1/2 times cooler on alcohol than it does on gasoline (which, by the way, would not be desirable ... since an engine must retain a certain amount of heat to run efficiently), the engine operates at temperatures only slightly cooler - about 20-40 deg F lower, depending on the specific engine when using alcohol fuel. When gasoline is burned in an engine, it produces carbon monoxide and other poisonous fumes ... mostly because of the fact that the fuel never combusts completely, and also because it's subjected to extreme temperatures and pressures. In addition, as we mentioned before, gasoline is a complex mixture of many substances ... and some of those substances are lead, sulfur, and other noxious materials. These, too, add to the contaminative effects of the engine's exhaust fumes. Alcohol, on the other hand, burns much cleaner. Even though it, too, never combusts completely, the volume of noxious fumes is drastically reduced in an alcohol-burning engine ... because alcohol contains oxygen in its structure (which means more thorough combustion) but doesn't contain all the other pollutants necessary as additives in gasoline. For comparison purposes, MOTHER's researchers ran tests on a 1978 Chevrolet taxicab ... which, operating in New York City, was subject to some of the most stringent pollution controls in the nation. (In order for cabs to be licensed, they must undergo - and pass - four scheduled EPA tests a year for carbon monoxide and hydrocarbons emissions.) Naturally, the taxi that MOTHER's crew tested was a lot less polluting than the average American automobile, but even in perfect tune it just "squeaked by" the tests using gasoline ... registering nearly a 1-1/2% CO and a 200 parts per million HC exhaust content (both just under the legal limit). With alcohol fuel, however, the test results improved enormously. Even with all pollution controls removed from the engine (except for the PCV valve), the cab registered a mere 0.08% CO and only 25 PPM of HC ... the equivalent of 95% less CO and 87.5% less HC, or a total of about 92% cleaner! As we all know (some of us from experience), water and gasoline don't mix. The gasoline tends to float to the top of the mixture, leaving the water to settle below it. In a car's fuel tank, this can be disastrous, particularly during the winter season. Alcohol, however, mixes quite well with water: The water particles distribute evenly within the mixture. As a result, not only is the winter freezing problem solved, but pure alcohol is not necessary for fuel purposes. This is very important to the small-scale alcohol fuel producer, since nonindustrial stills are generally not capable of producing more than 192-proof (96% pure) alcohol. As far as its use in an engine is concerned, MOTHER's researchers have had excellent results with various strengths of alcohol, from 160 proof to anhydrous (200 proof). Additional water added beyond the 20% limit causes the engine to hesitate and idle roughly ... hence that practice is not recommended. As an extra benefit, the water in the fuel helps cleanse and "lubricate" the internal parts of the engine, including the valve seats, piston head surfaces, and combustion chamber. The fuel economy of an engine is directly proportional to how rich the air/fuel mixture is ... and that, of course, is dependent upon how large the main jet in the carburetor is. Alcohol requires a richer air/fuel mix than does gasoline (9-to-1 as opposed to 15-to-1), but that difference is not reflected proportionately with respect to economy ... partially due to the fact that alcohol has a higher "octane" rating and can be utilized more efficiently. By experimenting with orifice sizes (diameters) of the carburetor's main jet, it is possible to reach a happy medium between power and economy in a standard auto engine using alcohol. 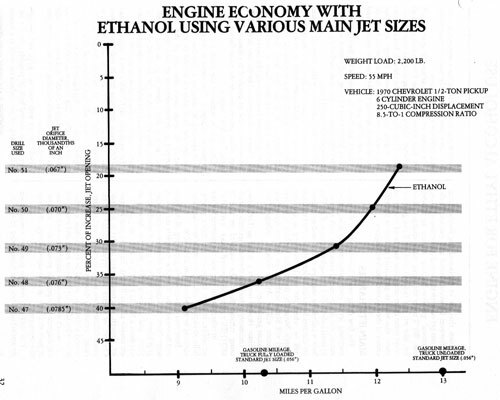 Referring to the "Economy" chart that follows, you'll see that a 40% increase in diameter over the standard jet size in MOTHER's truck resulted in a loss of only 12% of the total fuel economy ... as compared to burning gasoline and using the standard jet (the truck was fully loaded in both cases). With a step-by-step decrease in jet size - down to 19% larger than the original - only about 5% was lost when compared with the unloaded truck using gasoline and its normal jetting. When that test was made comparing both fuels in the fully loaded vehicle, the alcohol-powered version actually showed an increase in mileage ... by a whopping 16%. This is because an alcohol-powered vehicle - partly as a result of the fuel's high "octane" rating - will maintain its economy even under extreme loads, unlike most gasoline-powered cars. The figures given above were recorded when MOTHER's 1/2-ton pickup was pulling over 2,200 pounds ... and only improved slightly when the load was removed. In comparison, when the weight was removed from the truck in its gasoline mode, mileage improved substantially ... as indicated in the chart. It should also be noted that an increase in engine compression ratio will improve alcohol mileage considerably ... to the point where loaded or unloaded, any vehicle should equal or better its gasoline fuel mileage. An engine powered by alcohol - if converted correctly - will have performance equivalent to, if not greater than, the same powerplant burning gasoline. This is because of the fact that alcohol has a higher "octane" rating (hence the timing can be advanced slightly), and it can stand much greater compression ratios. Even without changing the compression ratio, an alcohol-powered engine with fairly low compression (MOTHER's pickup has a ratio of 8.5-to-1) still holds its own against its gasoline-burning counterpart. And, if the timing is advanced safely short of the "knock" limit, the torque range is broadened considerably, allowing the vehicle to pull under load exceptionally well ... in fact, it does much better under such conditions than the gasoline version does! We offer all kinds of certification exams including comptia security+ and gmat syllabus. Our guaranteed braindumps test prep classes exams are freely accessible all around the world of 648-385 and 70-516.